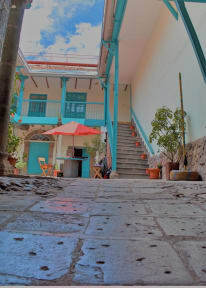 Gaia house hostel is a beautiful colonial property, located in the historical center of Cusco city, very close to the main tourist attractions in town, We have private rooms as well as shared dormitories, in Gaia House you will live unique experiences, different activities as games, music, walks around the city or outside it, culinary events, stories, sports activities and much more, relaxed atmosphere by the natural charm that transmits Gaia House in every corner of the hostel, the coffee bar will leave you speechless with a mixture of traditional and local aromas and flavors and if it is a drink, the best cocktails based on our national drink The Pisco or our traditional beers will revive your senses. Do not wait any longer to come, feel and live the charm of staying at Gaia House Hostel. 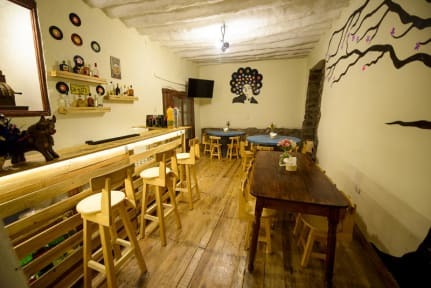 We are located in one of the best locations of the city, right near to some of the finest attractions and landmarks of the city such as The Cathedral of Cusco, La Plaza de Armas, the Saqsaywaman Historical Place and San Blas Temple, amongst other interesting spots of our city. We have two dorms with different capacities and divided by gender criterion. In addition, we have a private room, which is ideal for couples or friends travelling together because it can have a double bed or two individual beds depending on the needs and situation. Furthermore, we have several common areas and spaces where the guests can get together and exchange past experiences and future plans. Our local multilingual team helps and assists you with a warm and friendly service, let us be your best hosts during your stay. Payment upon arrival by cash, VISA credit cards, debit cards. The reception service is 24 hours per day. The maximum stay is of 20 days. Great place to stay if you are looking for peace and quietness. Staff is very friendly and helpful. Beds are excellent, warm blankets and comfortable mattress. Breakfast is very good with fresh fruit, bread en cereals. Super chill hostel. Rooms and bathrooms were spotless and the staff were lovely, they remembered all our names and helped us out booking our Machu Picchu trip. Wifi worked best out in the courtyard. Short walk to the main square. No complaints at all, a very relaxed stay. Very relaxing and quaint hostel. The beds are very comfortable, the showers are awesome and hot, and the WiFi is okay (works best in courtyard). Free breakfast was fine and is a quick walk to restaurants and the main square. My cousin and I loved our stay at Gaia house. The location was perfect. It is very close to the plaza de armas and it is right by a supermarket where you can buy water and other things. The breakfast was good. The receptionists were fantastic! They were always so kind and helpful and greeted us every time we returned to the hostel. The room was nice and we had hot water. The WiFi works well in the middle area, but not in the rooms. The WiFi was strongest in the morning and afternoon. Mi tresoro de hostal y de ciudad! Gracias totales! Very nice hostel, the rooms overlook a little courtyard with lots of seating, very cute. I stayed here one night in March, and it was very quiet and relaxed, which is what I was looking for. The breakfast was good, you can add eggs for a few soles, and the staff were very friendly. My only complaint is that there were no outlets near the beds in my room. I had a great experience at Gaia House Hostel; very clean and very nice staff. About 6 blocks from Plaza de Armas (10 min walk). Quiet and calm hostel. When we arrived, we were offered coca tea, we got suggestions for eating (El encuentro restaurant) and they were always very helpful calling us taxis, holding our bags after check out, asking how we were doing, what we did; I thought it was a very. I’ve gesture. I totally recommend this hostel.